Social networking sites offer great promise for those recovering from addiction. Rapidly changing technology and assumptions that this is all it takes are challenges facing this exciting new tool. It’s 3 o’clock in the morning. You can’t reach your sponsor and the idea of going back to drinking seems irresistible. You’re on a business trip in an unfamiliar city. You really want to go to an AA meeting, but you don’t know where to find one. You’ve recently kicked a drug habit, you’re feeling depressed, and your next counseling session is days away. In the past, there were few options for people in recovery in these situations. In need of immediate support but unable to find it, such people often had to rely on sheer willpower to prevent themselves from returning to their addictions. Then MySpace, Facebook, and Twitter came along and everything changed. As the popularity of social networking skyrockets, an increasing number of people in recovery are discovering that they can use the technology to connect instantaneously at any time with hundreds, if not thousands, of their counterparts around the globe. Such online connections are often beneficial, expanding and strengthening support systems. But social networking also comes with plenty of pitfalls, both for people in recovery and the social workers who serve them. Social networks devoted to people in recovery have popped up all over cyberspace, both within services such as Facebook or stand-alone Web sites. Examples of such sites include www.intherooms.com, www.addictiontribe.com, www.beatingaddiction.com, and www.soberrecovery.com. These sites generally feature discussion boards, blogs, galleries, links to news articles, and educational resources about addiction and recovery. Some sites also include listings of treatment centers and providers. Social networking related to recovery also has branched out into the world of mobile devices. Cellufun, a social networking service that people access with their phones or other mobile devices, has several groups formed by people recovering from drug and alcohol addictions. And ann-e is an application for the iPhone that allows people in recovery to connect with others and access a directory of 12-step meetings nationwide. The primary advantage of social networking is that it lets people reach out for support at any time, even when a meeting, a sponsor, or a counselor is not available, says Ryan FitzGerald, cofounder of WebTribes Inc, a California company that operates AddictionTribe.com. WebTribes also has social networking sites devoted to people with depression, anxiety, obsessive-compulsive disorder, and HIV/AIDS. Together, the sites have almost 50,000 members, including more than 5,000 members at AddictionTribe.com. Social networking empowers people in recovery to share experiences and help each other, says Ken Pomerance, cofounder of InTheRooms.com. The site, launched in 2008, now boasts 60,000 users living in 50 countries. The ability to connect electronically with other people in recovery is especially useful for those who are isolated due to geography or social phobias, says Elizabeth Mullins, LCSW, PIP, who operates a private practice in Birmingham, AL, called Life Map Counseling. Mullins is among a growing number of mental health professionals and treatment providers who are tapping into social networking to market their services and provide educational resources to people in recovery. She recently started a page on Facebook where she posts inspirational quotes and articles about recovery, among other items. Fans of the page have also posted links and materials they believe may be useful to others. In addition, Mullins uses phone and Internet meetings to connect with clients, along with recommending relevant iPhone applications and Web sites. The interactive nature of Facebook pages means that treatment providers can get timely feedback about what types of information and resources people find useful as they pursue recovery, says Richard Foster, PhD, executive vice president of treatment programs for Gateway Rehabilitation Center in Pennsylvania. The center has two pages on Facebook: one with information about the center and its offerings and another for alumni, potential clients, and people who may be concerned about loved ones battling addiction. The center has pages on Twitter and LinkedIn as well. Despite the possibilities social networking presents to people in recovery, FitzGerald and Pomerance say their sites should not be seen as replacements for the face-to-face contact that is integral to the success of 12-step meetings, support groups, and counseling sessions. But some professionals who work with people in recovery worry that some people will prefer seeking advice on the Internet over more traditional forms of support. These people may replace their dependence on drugs, alcohol, or certain behaviors with an overreliance on the fast-paced world of online communication, Estrin says. “The drugs take the individual out of life, and technology has the potential to connect these same people but in a way that is not fully authentic or as integrated as is necessary to truly bring the addict out of the shadows and offer the necessary tools to effectively navigate life drug free and out from behind the screen of a computer,” he says. And there’s no guarantee that people offering advice online to people in recovery have a clear understanding of what they are talking about or even are who they say they are, says Jennifer Ginsberg, MSW, MAJCS, an addictions specialist practicing in California. Social networking, while built on the premise of helping someone form scores of new relationships online, may erode the real-life relationships with family and friends that are necessary for people in recovery, says Jennine Estes, MFT, a California-based therapist. For example, couples may be torn apart when one partner allows an online relationship to become sexual. Social networking also has the potential to change the dynamics of relationships with therapists. Clients who are used to having an instant support network online may come into the therapeutic relationship with expectations that therapists can “cure” them quickly and effortlessly, Estes says. And for mental health and addictions specialists who venture into the world of social networking, the experience can be filled with ethical landmines. Mullins is learning that lesson as she proceeds with her Facebook page. People who become fans of her page can post whatever they want, including potentially offensive material. Trying to prevent such posts, Mullins e-mails each fan to explain the rules of the page, let them know that posts are not confidential, and make it clear that the page is not a form of therapy. The page itself also includes a disclaimer. But that hasn’t stopped Mullins from worrying. What, she wonders, would happen if a fan posted that he was going to commit suicide and she did not see the post in time to try to stop it? Could she be held responsible? Although there is debate over the benefits and dangers of social networking, there is agreement that its use in the recovery community is only going to grow. 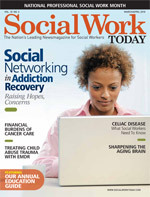 So how should social workers prepare themselves to work with Facebook- and Twitter-savvy clients? Estrin believes the worst thing professionals can do is dismiss social networking’s impact on their clients. Estes agrees. She encourages professionals to get involved in social networking activities so they can see firsthand how the technology works and consider the implications. Treatment providers also should become more aware of how they can use social networking as a communications, public relations, and educational tool, says Foster. They cannot ignore the trend but should proceed slowly and cautiously, he notes. The need for awareness extends to schools of social work as well. Estrin argues that educators need to do a better job of preparing students to practice in a world where many clients’ lives are dominated by technology. Schools should make sure students are well versed in what interventions are research tested and evidence based so they can educate clients who are increasingly swayed by what they see on the Internet, he says. Joshua Estrin, MS, LCSW, is a self-proclaimed technophile who prides himself in staying current with the latest trends related to social networking tools such as Facebook, MySpace, and Twitter. But even Estrin can’t keep up with the speed at which the technology is growing and evolving. “I consider myself a geek, and it seems that every day something is coming out that is like ‘I didn’t know about that,’” says Estrin, an adjunct professor of social work at Florida Atlantic University. • In January 2009, Facebook announced that it had 150 million active users. Just one year later, the site has more than 350 million active users. The average Facebook user spends 55 minutes per day on the site. • One of every 11 minutes spent online globally is spent on social networking and blogging sites. • The total number of minutes Americans spent using social networking sites grew by 83% between April 2008 and April 2009. During that period, the number of minutes spent on Facebook increased 699%, and the number of minutes spent on Twitter grew by 3,712%. • In 2009, 46% of those American adults who used the Internet visited a social networking site. That’s up from 8% in 2005. • Nearly three quarters of American adults who use social networking sites have a Facebook account. Other popular services include MySpace (48%) and LinkedIn (14%). • Seventy-nine percent of adults who use social networking sites are between the ages of 18 and 44, but such sites also are growing in popularity among adults aged 45 and older. • An increasing number of people are accessing social networking sites through their cell phones or other mobile devices. Such activity grew by 156% in the United States during 2008.